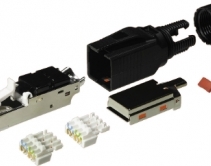 By Robert Archer · February 6, 2019 • The newly announced Kordz ONE Series CAT6 RJ45 and CAT6A RJ45 field termination connectors provide integrators a choice of Cat-6 and Cat-6a connectors for use in Ethernet cable termination. By Advertorial · December 6, 2016 • Make the most from the Mirage eSeries with eAudioCast™ for flexible, profitable, decentralized multi-room music. By Jason Knott · October 5, 2016 • Newly ratified IEEE 802.3bz standard opens an upgrade path from 1 Gigabit to up to 5 Gigabit speeds for more than 70 billion meters of Cat 5e / Cat 6 cabling sold in commercial and residential markets. By Tom Cunningham · March 20, 2014 • Committing solely to wireless technology is 'a recipe for failure' for integrators. Here are the four home network infrastructure options to consider for every project. By Robert Archer · December 3, 2013 • The newly announced S28fe and S20fe gigabit switches from Pakedge offer 24 and 16 ports each respectively, and the California company says the unmanaged switches are plug-and-play solutions that support network speeds of 10, 100 and 1000Mbps. By Robert Archer · April 26, 2013 • Legrand has introduced its latest line of Cat-5e, Cat-6 and Cat-6a patch cables, and the Penn.-based company says the products surpass the specifications mandated by the telecommunications industry. By Robert Archer · April 1, 2013 • NTW says its PortBlockers product can protect unauthorized users from using RJ45 inputs and can be employed in environments ranging from corporate and finance, to food and healthcare industries. By Robert Archer · October 19, 2012 • Key Digital's KD-CATHD500 Cat-6 balun is a HDCP compliant solution that installers can use to transmit high definition video and audio for distances up to 600 feet. By Robert Archer · June 7, 2012 • Metra Electronics' Ethereal brand's new HDM-CAT6SC solution is compatible with the HDMI 1.4a format and it provides a signal gain capability as high as 39dB. By Robert Archer · May 9, 2012 • RTI is now shipping its ESC-2 Ethernet to Serial Converter and the company says the product is designed to expand the capabilities of its XP Series Control Processor. By CE Pro Editors · June 27, 2011 • New agnostic IEEE P1905 standard would allow combination of powerline, wireless, coax and Cat 5 home networking transmission technologies. HomePlug announces support. By Robert Archer · June 6, 2011 • The company's self-terminating wall jack product eliminates the need for punchdown tools and it works with Cat-5e and Cat-6 cables.